If your floors are damaged or worn from years of foot traffic, it’s time to consider something new. We offer a huge variety of carpet flooring for residential and commercial customers. As a proud member of the Flooring America network, we are dedicated to providing you with quality carpets at an affordable rate. 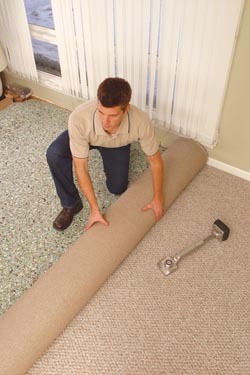 Our team also provides professional carpet flooring installation to ensure you are fully satisfied with your purchase. How do you know what type of carpet is right for your home? Every property is different, and all homeowners have unique tastes. When you visit our carpet store, a friendly, knowledgeable member of our sales team will sit down with you and help you choose a great carpet for any room. Whether you’re looking for a frieze carpet or an area rug, we’ve got you covered. We carry a range of high-quality floor coverings made from nylon, polyester, wool, and other materials. Our associates consider your budget, lifestyle, and tastes when helping you select the perfect carpet floor. We carry carpets in a wide variety of colors to complement virtually any décor. Ranging from dark chocolates and wines to creams and greys, our selection includes something to suit every aesthetic. Whether you’re looking for a carpet for your bedroom, home office, living room, or hallway, you’re sure to find a great product at our store. Installing a carpet requires specialized skills and equipment. The expert contractors at our flooring store deliver impressive results on every job, properly removing your existing floor coverings and replacing them with the carpets of your dreams. Our professionals employ their skills and the latest tools to cover every section of floor in your rooms. Our goal is to ensure that you are 100% satisfied with the results. We make the whole process easy from beginning to end. As carpet flooring installation professionals, we often work in people’s homes, and we always remain conscious of the fact that we are in your personal space. We do everything was can to minimize inconvenience and treat our customers and their families with respect. All our team members are polite, friendly, and hard-working. We strive to get the job done quickly – while ensuring our high standards are met -- so that you can start to enjoy your newly carpeted room as soon as possible. Not all carpets are created equal. We only stock high-quality products from the nation’s most trusted brands, such as Shaw(tm) and Mohawk(tm). In our carpet flooring department, you’ll find the products that professionals trust. These carpets are manufactured to deliver outstanding performance for many years. Carpet protects your floors from damage, so laying carpet is an excellent and cost-effective way to maintain the value of your home. Even if the buyers intend to remove the carpet from some rooms, they know that the floors beneath have been protected from dents, scratches, and light damage. That means they may pay more for a house with carpeting. A carpet floor makes any room feel warm, cozy, and welcoming. Laying carpet over a wood or tile floor can completely transform a room. Imagine feeling deep-pile carpet beneath your feet on a cold winter morning or playing with your kids on a beautifully carpeted floor. There are many advantages to choosing carpet flooring over hard flooring. Carpeting absorbs noise and reduces the chance of injury in the event of slips or falls. These qualities make it a great choice for families with young kids. It also adds an extra layer of insulation between your living space and the ground, which can significantly reduce your heating costs in the winter. Carpets even improve the air quality in your home. The fibers trap dust, pollen, and allergens safely at ground level where they are easily vacuumed. That means they no longer circulate in the air, which is a blessing for any allergy sufferer. Contact us today for a free consultation to ensure you get the perfect carpet to suit your needs. We proudly serve clients throughout Raleigh, Wake Forest, Rolesville, Youngsville, and Louisburg, North Carolina, and the surrounding area.